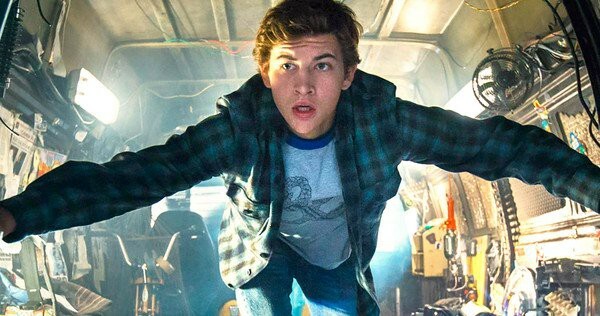 The retro pop culture artifacts in Ready Player One literally come flying. Sneeze and you’ll miss a Jurassic Park T-Rex on the chase or a racing Back to the Future DeLorean. Roads? You don’t need roads when Godzilla or the Iron Giant or the baby monster from Alien come charging at you in a virtual reality universe. Now let’s come down to Earth. 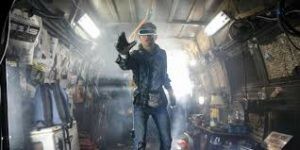 For all Ready Player One’s much-hyped obsession over beloved nostalgia, decades from now, the actual product on the screen — a wild, chaotic, ambitious, booming, overwhelming extravaganza — will not itself be considered a cherished classic. Director Steven Spielberg has made a movie of the geeks, by the geeks and for the geeks. He wanted to make entertaining amusement park ride, and, wow, does he succeed. But don’t mistake nifty VR game play with universal, wondrous touchstones such as E.T. healing Elliot or humans triumphing over dinosaurs or Indiana Jones out-running a boulder. Jukebox music from the glorious decade that is 1980s is your soundtrack, and I pity the fool that doesn’t appreciate a movie that begins with the synth-keyboard sounds of Van Halen’s rock staple “Jump.” Say what’s up to a nerdy teen named Wade Watts (Tye Sheridan, X-Men: Apocalypse) that resides in Columbus, Ohio, in 2045. As he explains it, the world has become so economically bleak that most people spend their lives wearing heavy headsets and immersing themselves in an expansive virtual reality world called OASIS. This is where Wade, i.e., the cool blond-haired avatar “Parzival,” surfs and shoots and hangs with his other avatar pals. An odd, reclusive and pop culture-loving genius named James Halliday (Mark Rylance) created the OASIS. (Cue Tears for Fears’ “Everybody Wants to Rule the World.”) After he dies, he leaves a tantalizing message to his masses of fans. Halliday conceived of one last game within the game. And whoever can first solve the three-part quest, unlock the mystery and find the ultimate golden Easter egg will receive Halliday’s half-trillion fortune — and assume complete control over the OASIS. Wade wants it. For help, he recruits his fellow Gunters (Easter Egg hunters), including Artemis (Olivia Cooke) and Aech (Lena Waithe). Of course, every Willy Wonka & The Chocolate Factory tale needs a Slugworth. This villain is Nolan Sorrento (Ben Mendelsohn), a former Halliday intern that now runs an evil corporation solely designed to snare the egg. They send players into the game every day to find them, but only scrappy Wade has an uncanny ability to solve the riddles. Spielberg is a master at visual storytelling, obviously. Despite some sensory overload, there’s no denying he can still weave mind-blowing action sequences. Wade speeds through the OASIS as familiar characters pass through the side windows. Maybe I’ll catch them all by the fourth viewing. The Gunters venture into a make-shift setting of a familiar horror movie and experience the same scares that viewers did decades ago. The glut of references isn’t a catch-all crowd-pleaser. A child of the 80s, I admit I lapped up a “Zemeckis Cube” that can bend time. But I doubt an actual child will get any joy or muster a secret smile out of a Monty Python quip or a Michael Jackson “Beat It”-era costume. I also wish the well-known cuts were more inspired. A Chucky doll gag comes at the most obvious time, as does the one for Say Anything. . . And Batman is wasted! Didn’t cowriter Ernest Cline, who based the screenplay on his bestselling novel, see The Lego Movie? Life in The Real World isn’t nearly as colorful. The characters’ backstories are treated as pesky narratives that lack depth. Wade mentions exactly once that he’s an orphan, and it serves no purpose to his arc. A love story is paper-thin: Wade has a crush on Artemis and we must all cringe in unison as he discovers her real identity and falls in love with her anyway even though she has a birthmark on her face. This is neither the decade nor the place to get so schmaltzy. You’ll root for the kids only because Mendelsohn’s villain is such a sneering bore. Leave it to Rylance, an Oscar winner for Spielberg’s Bridge of Spies, to carry the entire emotional heft in Ready Player One. His Halliday is no chilly, arrogant Steve Jobs; he’s just a painfully shy computer nerd that finds comfort in hiding from the world. He can’t even manage to take a girl dancing. After the pretentious slog that was The Post, what a thrill to see Spielberg press the rewind button and craft a true spectacle. And flaws aside, I’m not going to be the curmudgeon that dissuades anyone from buying into old-fashioned futuristic fun. Might as well jump to it.